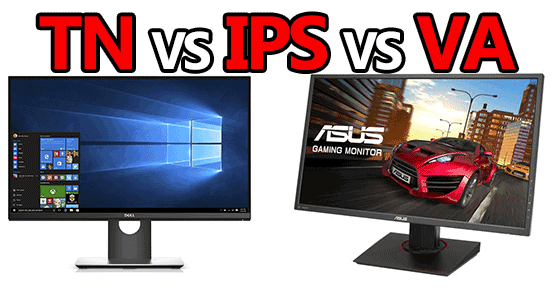 TN vs IPS vs VA monitors – What’s the best? Beyond resolution and size, picking a monitor is easily one of the most overlooked steps in putting together a good setup for gaming. It should go without saying that when you’re gaming it pays to have the best monitor for the job. To do that you not only want the right size and resolution, but you also want the appropriate panel-type that will cater to what you use your monitor for. For the purpose of this post, we’re going to focus almost entirely on panels suited for gaming. So, which panel-type is the best to use for gaming? TN, IPS, VA, or something else? Let’s take a look! There are lots of different types of panels that could be used in a monitor; out of these, Twisted Nematic (TN), In-Plane Shifting (IPS), and Vertical Alignment (VA) are easily the most common. Beyond those three there are a handful of very similar options, some being proprietary to specific companies and some being slight offshoots of the original (like PLS vs IPS for instance). Since picking the best monitor for gaming boils down to finding the right type of panel, let’s take a quick run through what the 3 primary panel types offer. TN: Twisted Nematic panels are easily the most affordable and the most common. Not only are TN panels affordable and easy to find, they’re often cited as one of the best to use for high-intensity gaming where low response times (as low as 1ms) and high refresh rates (144Hz+) are crucial. However, TN panels also have the most narrow viewing angles as well as the worst color reproduction when compared to IPS and VA panel monitors. Because TN panels have such narrow viewing angles, they’re usually not the best to use for large high-resolution monitors. VA: Vertical Alignment panels are a step up from TN in terms of both max viewing angle as well as color reproduction. However, they still suffer from a significant loss of quality and color shifting when viewed at extreme angles – not really an issue if you’re gaming in front of your monitor instead of beside it. Like TN panels, VA also boasts low response times (down to 1ms) as well as high refresh rates (144Hz+). With all that said, it’s safe to assume that the majority of VA panel monitors are going to be more expensive than TN. In terms of monitor panels for gaming, VA is often considered the best choice by most people. IPS: In-Plane Switching offers the best color reproduction as well as the widest viewing angles compared to other monitor panels. That makes IPS monitors a favorite of graphic designers, video editors, and anyone else who relies on highly accurate and consistent color reproduction. That said, they’re not usually the best for gaming in comparison to both TN and VA panels due to their reputation of ghosting as well as having higher Gray-To-Gray (GTG) Response Times (4-10ms is common). But, not all IPS monitors suffer from ghosting and it’s definitely easy enough to find one with a good GTG response time for gaming (under 5ms). TN monitors are inexpensive but work well for gaming. TN also have the worst color reproduction and most narrow viewing angle. VA monitors are a little more expensive than TN but are objectively superior in every other way. IPS monitors are good for high resolutions, accurate color reproduction, and wide viewing angles. IPS (and PLS) are often considered the best for workstations but can also be used for gaming. At the end of the day, picking the best monitor for gaming involves a lot more than simply looking at the resolution and size. To get the best experience (and to make sure you’re not wasting money) you should have at least a basic idea of what the different panel types offer as well as the other specs to look out for – all of which are covered in this post. At the very least, you also want to take into consideration the response time and the refresh rate of any monitor you’re looking into. As always, I hope this helped if not only a little! If you have any questions, don’t hesitate to leave them in the comment section below! What you say about curved screen monitors?